Textile artist and surface designer Mandy Pattullo combines fabric with collage techniques to produce beautiful pieces of art. In Textile Collage she shows a fresh way to use scraps and oddments of fabrics to create something unique and personal, while also being economical perfect for those who have hoarded bits of fabric, trim and memory-filled domestic textiles over the years. Chapter one covers 'Materials': collecting and sourcing fabric including unpicking and storing found fabric. In chapter two, 'Make', Mandy guides you through all the artistic and creative elements that you need to consider to create a beautiful collage. The following chapter 'Portray' looks at piecing together a collaged portrait human or animal showing the figurative approach in collage work that includes transfer images and using found photographs. In the chapter 'Worn', the collage technique is used to embellish skirts, jackets and accessories. The final chapter 'Book' looks at the fabric book as a receptacle for textile collage, with a range of approaches and forms explored. 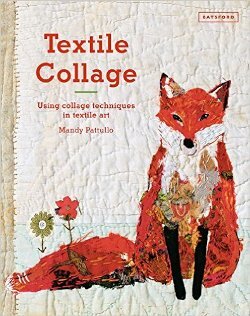 This is a wonderful resource for all textile artists looking to make the most of the found fabrics they love and fully explore the technique of collage with textiles.